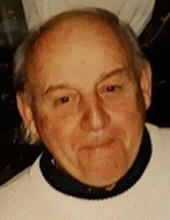 Joseph James Matura, 88, of Glen Ellyn, IL, died on January 26, 2019, at the Illinois Veterans Home, in Manteno, IL. He was born on December 31, 1930, in Chicago, IL, the son of Joseph and Frances Kostecki Matura. He was married to Noreen Connery and she preceded him in death in 1987. He then married Polly A. Tomaski on October 31, 1992 in Fontana, WI. She survives. He is also survived by a daughter and son-in-law; Joy and Andrew Squier of Elmhurst, IL, one son and daughter-in-law; Michael and Karin (Lijana) Matura of Burr Ridge, IL. Also surviving are five grandchildren; Luke Squier and Rebecca Squier of Elmhurst; IL, Madelyn Matura, Max Matura, and Michael Joseph Matura of Burr Ridge, IL. He was preceded in death by his parents and one brother, Richard Matura. He was employed as a Food Service Operations Manager with Pacific Coast Marketing. He served in the United States Army during Korean War. He enjoyed playing golf. In accordance with his wishes there will be no visitation or memorial services, cremation rites have been accorded. To send flowers or a remembrance gift to the family of Joseph James Matura, please visit our Tribute Store. "Email Address" would like to share the life celebration of Joseph James Matura. Click on the "link" to go to share a favorite memory or leave a condolence message for the family.